In early 2012, Scott and Lindz Lane, of Miss Piggy’s BBQ team in the UK met me through Benny Adauto, my former SYD assistant, who lent them equipment to compete in the Ultimate BBQ Showdown East v West in Wildomar, near San Diego, in April 2012. I met them together with Benny for lunch in downtown Los Angeles and the conversation drifted towards whether I was willing to teach to increase the popularity of American BBQ in the UK since many had watched TLC’s BBQ Pitamasters Season One which we were in. Scott subsequently introduced me to Toby Shea, the director of the British BBQ Society, and we hit it off right away. In July 2012, I’ll be headed to teach in the London area and compete in the UK! To celebrate this opportunity, I planned to cook a British dish in my UK class. 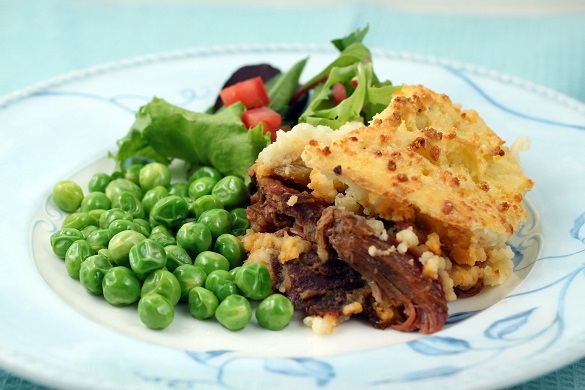 One of the most traditional British dishes is a classic dish called Sheppard’s Pie which is cooked lamb topped with mashed potatoes and then baked. 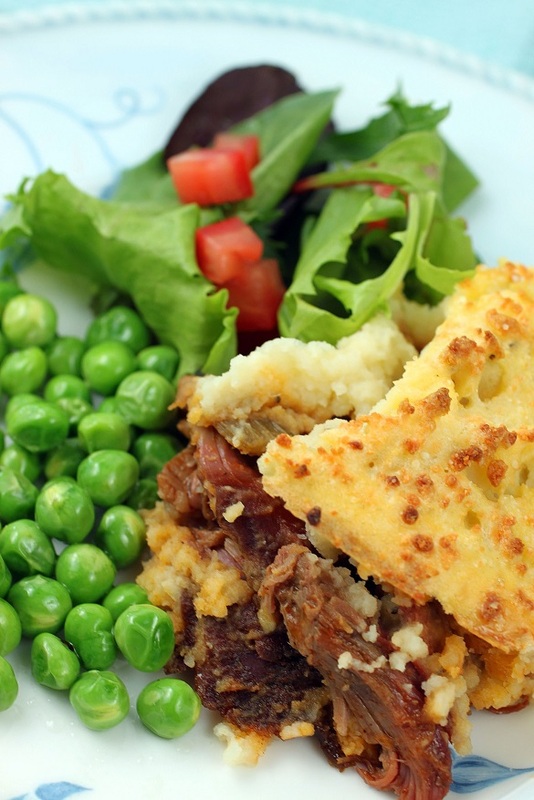 In the US, we do something similar using ground beef and although it’s called Sheppard’s Pie, it is really Cottage Pie according to British convention. To add a BBQ pitmaster’s twist, I decided to barbecue the lamb before making the pie. 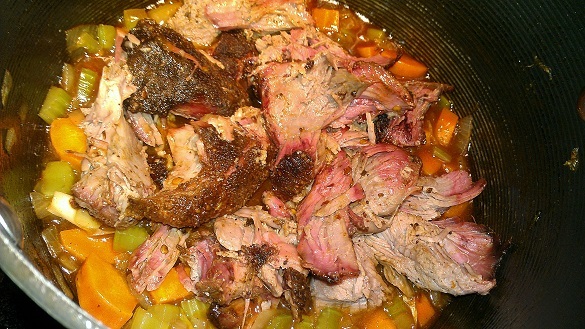 After the lamb is cooked and cooled, you shred the lamb with your fingers and mix it with a mire pox of onions, celery, and carrots. 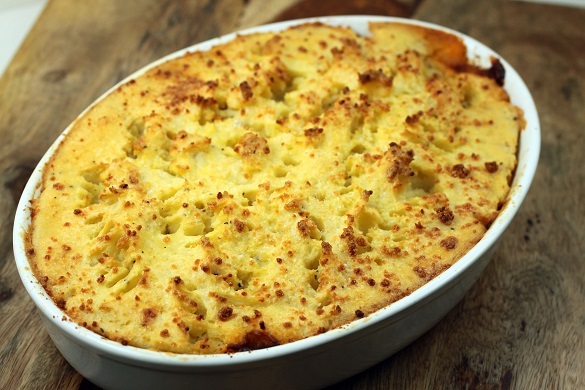 Transfer to an oven-safe casserole and top with your mash and bake for about 25 minutes. Serve with English peas. I prefer my peas el dente but I was informed by Eric, an English butcher in Los Angeles, that the peas should be cooked until they are mushy and no longer green. Do your peas your way! Trim excess fat from leg of lamb. Apply thin layer of yellow mustard all over the leg of lamb to make it easier for the rub to stick. Apply a medium coating of SYD Hot Rub until the meat is completely covered and you cannot be seen through the rub. Cook in a 250 degree smoker with some apple wood. Check after a couple of hours to see if the bark has formed. If it has not, check back every 30 minutes until the bark is set. Foil your whole leg of lamb after bark is set and put some mopping liquid into the foil (you can use red wine, chicken stock, beer, etc.). Cook the foil pouch and probe your meat through the foil until it feels tender when you probe it. The internal temp when done is between 175 to 195. Don’t rely on the temp reading but by the feel of the meat when you push the probe in. Mine was done to probe perfection in about 4 hours. Remove and cut open the foil to let it cool and then shred into chunks. Heat canola oil in pan and add mire pox mixture of onion, celery, and carrot. Cook until vegetables are tender and add the rosemary, garlic, tomato paste, Worcestershire, BBQ sauce, and chicken stock. If you don’t want a BBQ flavored pie, substitute with brown gravy for the BBQ sauce. Mix well and heat until boiling. Add shredded BBQ lamb. If mixture is dry, add more red wine or chicken stock. The mixture of lamb and vegetables should be a bit soupy. Season to your taste with salt and black pepper. Easy SYD Mash – Bring 6 cups of water to boil in a pot. Add 3 heaping tablespoons of chicken bouillon powder. Add 4 large potatoes peeled and chopped. Cook until tender and mash with some butter, milk, salt, and white pepper. Paint the top of the mashed potatoes with beaten egg wash. Use a fork to make stiff peaks. Bake for 20-25 minutes in 400 degree oven until crust is browned. Serve with some English peas sautéed in butter. Great recipe and will definitely be giving it a go this weekend, can only assume Eric is a northerner, mushy peas only go with fish and chips! !